It's hard to describe the benefits and drawbacks of a specific gaming mouse, in many ways. Certainly, I can discuss whether the drivers work, whether the buttons work, whether any programming is intuitive and whether the product works as advertised—and in a moment, I will. The biggest problem with describing a mouse, though, is that it's got to be the piece of hardware most overwhelmingly subject to personal preference. A mouse is an even more personal decision than a keyboard. We all have our personal likes and dislikes for the feel and look of keys under our fingers, but a mouse... you're holding it all day long, and where a game controller is always the same size, and demands the player adjust, a mouse is much more variable. 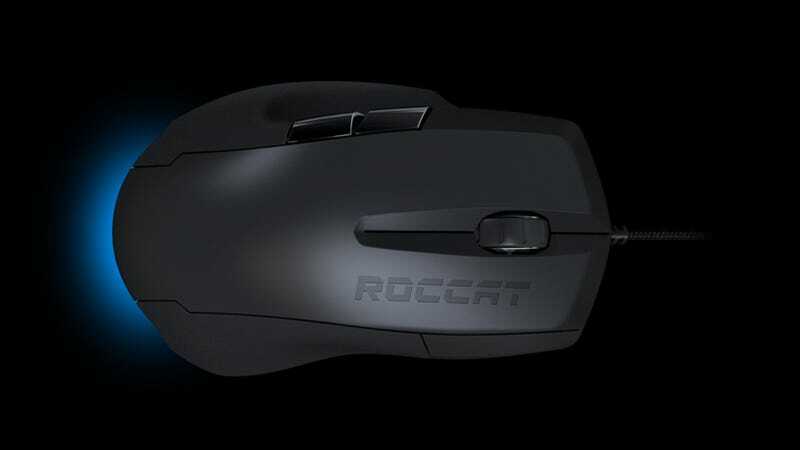 And the Roccat Savu, sadly, is one that's clearly not made for me. The Savu looks quite nice, and it feels pretty solid out of the box. It's got enough heft not to feel flighty, while still remaining lightweight. All seemed to be going well as I unwrapped it and plugged it in. That was a few days ago and while as far as my PC is concerned, the experience is going well, my body, alas, begs to differ. Finding and installing the drivers from the Roccat website was intuitive and painless, and learning to use the Easy-Shift features didn't take long, either. Between the scroll wheel and two thumb buttons, in addition to standard right- and left-click, the Savu can hold over a dozen programmed commands, and they're easy to remember and to change. As well, the Savu lets users save five distinct profiles of commands, for different games and purposes. Lighting is part of the profiles, too, which is helpful for remembering what it's set to. I developed a basic Windows profile (where buttons controlled volume and web browsing) with a green light, and enabled several of the Dragon Age macros on a second profile, with a lavender light. When I wondered why the volume controls were no longer working, glancing down and seeing the purple glow was an immediate and welcome tip that the problem was human, not software- or hardware-based. For all that the programming and details work well, though, the Savu and I just do not get along. After three days of using the Savu in place of my normal mouse, my hand has raised many objections. Since the switch, any time I'm either gaming or working at the PC for more then 30 or 40 minutes, my fingers start to hurt. The joint where my thumb meets my hand doesn't feel too great, either. In short, it's not the mouse; it's me. My hand and this mouse are as much the wrong shape and size for each other as it is possible to be. Over the few days I've been using it, I've done much gaming, much general writing and web use, and a good deal of Photoshop work as well: three different uses, three different kinds of adjustment. I thought maybe my initial discomfort was just the shock of change (I've had my "standard" mouse for well over a year, and the one before it was an almost identical model that the cat killed), but the more I use the Savu, the worse my discomfort gets. There's a very specific thumb groove that I keep automatically aligning my thumb into, but that alignment puts the rest of my hand out of place. My impulse is to slide my fingers further down the buttons than I need to and as a result I'm kind of contorting my hand. It's clearly not working at all for my joints. Meanwhile, I don't enjoy the feel of the rough textures on the sides under my thumb, and while the "ROCCAT" imprint across the right button does indeed remind me that my finger is in the right place, it feels strange and unpleasant against my finger. The grooves are an irritant. It's frustrating, because the mouse itself works very well and has comprehensive, comprehensible software that makes it quite user-friendly. Ergonomics, though, are no joke—especially for someone who routinely uses the PC in question for more than 10 hours a day. For use with the doomed Savu, though, Roccat also sent a fancy high-tech mousepad, the Hiro. The Hiro promises many fine features, such as quiet use, smooth gliding, and being easy to clean. It also intrigued me with a promise that the fabric it's made from won't fray: "Thanks to a power-bonded construction between upper and lower surfaces," as the website explains, "the Hiro's edges won't fray – durability that translates to the longest life of battle readiness, no matter how aggressively you game." If I still worked in an office, I might not care about these features as much. However, we have a little grey house cat who fancies himself the destroyer of worlds. And at the very least, he's had much success as the destroyer of his humans' PC equipment. My current mousepad has been sneezed on, chewed on, napped on, and clawed at one time too many, and I eagerly welcomed a replacement. The bad news is, Roccat's wrong about the fraying. It took maybe two or three minutes of me worrying at one of the corners with my girly-girl fingernails before loose threads began to sprout. Now, it's true that actively plucking at the corners of a mousepad isn't exactly normal use. I might, in fact, absent-mindedly toy with the thing under ordinary circumstances, but it wouldn't always be the same spot and it would probably take me months to wear down. So I forgive the failed no-fray promise. And happily, the Hiro makes good on pretty much every other promise. With the Savu, you need a mousepad of some kind. It's completely non-functional on the surface of my (dark "wood" IKEA) desk, but does indeed glide smoothly and cleanly over the Hiro surface. The Hiro has also been easy to get the cat hair off of, and does indeed stay firmly put in place when something (i.e. the cat running full tilt into the desk) jostles my workstation. My final verdict on the Roccat products, then, is that the fault lies not in them so much, but in me. Just as there are some quite nice athletic shoes I'd never wear, this is a quite nice mouse that I won't be using in the future—but that doesn't mean it doesn't have much to offer others. For an easy-to-program gaming mouse, the Savu's a pretty solid bet.